Raging Swan Press has released the Gloamhold Campaign Guide. Phase one of my sinister design is complete. But, of course, given there is a phase one, it follows there is a phase two! Gloamhold was always going to be huge. And huge dungeons require a huge amount of work. And huge amounts of work require huge amount of time. I’m very comfortable working to long time scales—I’m a patient man—but still I didn’t want to wait five years to release Gloamhold. As a proper megadungeon, after all, Gloamhold is a living, breathing place. While it’s my baby, I’m looking forward to seeing what other people do with it; that’s part of the joy of megadungeon design, after all. Thus, the Gloamhold Campaign Guide is just the first of many releases I plan for the megadungeon. If you are familiar with Raging Swan Press’s release schedule, you’ll know we release little but often. Our typical weekly release is a short supplement detailing a particular locale such as village, trading post and suchlike. I plan to follow a similar release schedule with Gloamhold. Starting later this year, we’ll begin to release seven-page supplements providing more details about specific levels and locales in the megadungeon. We’ll go about this in a logical fashion. There’s not much point detailing the Twilight City, for example (no matter how much I want to), if we haven’t first dealt with Gloamhold’s outer reaches. After all, what are the PCs more likely to explore first? In tandem with these dungeon-focused releases we’ll also finish releasing supplements detailing Ashlar’s various villages and towns. Chief amongst these is an update of Hard Bay (coming jolly soon), a new Village Backdrop featuring the halfling village of Underdell and town backdrops presenting Dunstone (which is in development as I write this) and Languard. All will be available in Pathfinder, 5e and System Neutral editions. Hopefully, that gives you a insight into my sinister, long-term plans. If you’ve got questions, comments or suggestions, I’d love to read them. Leave a note below! 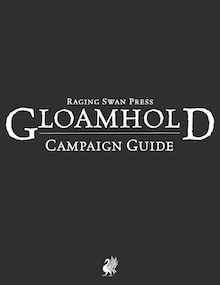 The Gloamhold Campaign Guide is now available from Raging Swan Press at all the normal places. Want to watch the Gloamhold video? Head over to Raging Swan Press’s Youtube channel and check it out. I’ve been reading the Gloamhold guide and I cannot wait to see more material forit, it’s a fantastic setup for a megadungeon. Thank you Gareth. I’m also rather keen for more of Gloamhold to emerge into the world. I really love your Gloamhold Campaign Guide! I´ve seen you´ve released some Village Backdrops and kind of stuff which are part of the Gloamhold surroundings! Is there a list of already available PDFs? Thank you also for the kind words! They are much appreciated. It would be great if you made Heroes & Other Worlds edition.